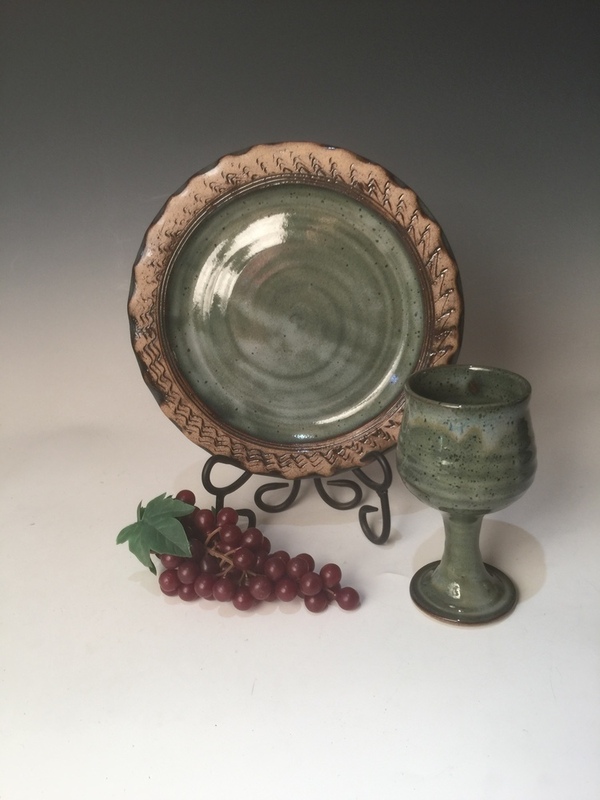 This handsome pottery communion set consisting of a chalice and paten is glazed in our signature glaze with with interesting color variations. The chalice and paten set has a textured border design that is highlighted by the glaze. The symbolic beauty of the sacrament of the Eucharist (Communion or Lord’s Supper) is celebrated in churches with a sense of awe and reverence. Now pastors and congregations can enhance the symbolism with communion vessels that complement the beauty of the ritual. This beautiful communion set would be wonderful for use in a wedding or a congregational setting. The glaze on this liturgical ware is food and dishwasher safe. The chalice is about 6 inches high and 4 inches wide and holds about 8 ounces of liquid. The stem of the chalice is hollow. The paten is about an inch high and 9.5 inches wide and is glazed on the underside. All measurements are approximate because hand made pieces vary slightly. "As long as you own this piece, you will always have a Miracle."